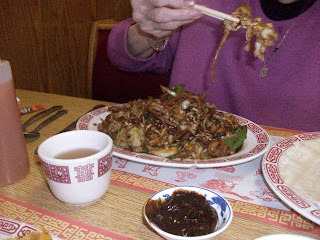 My mother and I had lunch at Yung Ting Chinese Restaurant today. Yung Ting is the best Chinese restaurant anywhere outside of New York City. (I'm not sure about California. 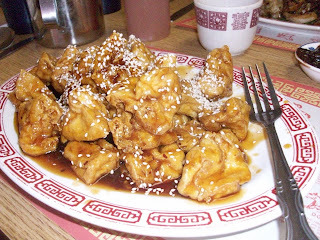 California probably has a few good Chinese restaurants, too. But I haven't been to one.) 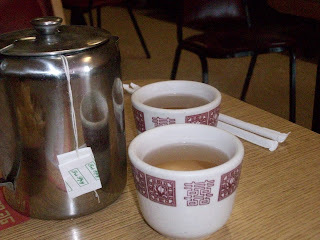 If you are ever driving along Route 15 through Lewisburg, PA, stop into Yung Ting, in the Plaza 15 Shopping Center. Yum, yum. I had my current "usual" -- Sesame Bean Curd. My other favorites here are Broccoli in Garlic Sauce and Cold Sesame Noodles. Remember, I'm a mostly vegetarian. I have tried to replicate the bean curd they make here, unsuccessfully. The consistency of the tofu is chewy and yet light. Mmmm. My mom had Moo Shu Pork. We both had tons left to take home for later. My mother and I go out to eat once a week or so. We like to try different places, but Yung Ting is one place we don't mind repeating.